I first met the man who would become America’s 41st president in 1968. 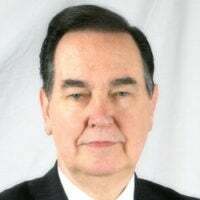 He was a Houston congressman and I was a young reporter for a local TV and radio station. Bush was a letter writer like none other. I think I have an almost complete collection of his notes and letters, some typed, some handwritten, from every position he held in public life. These include congressman, Republican National Committee chairman, chief liaison officer to the People’s Republic of China, U.N. ambassador, CIA director, vice president, and president. 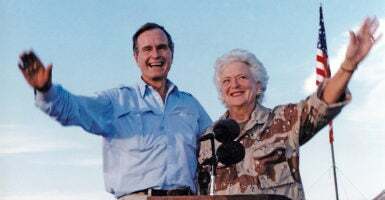 One time we were scheduled to meet at Walker’s Point, the Bush family compound in Kennebunkport, Maine, where they had vacationed for decades. Bush had to cancel due to an unexpected visit from an ambassador. Apparently concerned that my feelings would be hurt, he instructed an aide to get a phone number where he could call me. I gave him a payphone number at a local hardware store—this was before cellphones had become ubiquitous—and he called to apologize. Our last meeting was two years ago at Walker’s Point, and this time he didn’t cancel. My youngest daughter was with me. We were told that the president sometimes appeared to doze off, but that he was listening. We had a wonderful visit, recalling Houston days. He asked questions and seemed lucid and interested in talking politics and world events. On one visit to the Oval Office when he was president, he sat behind the desk and I sat in a chair next to him. When I showed his son, the 43rd president, that picture some years later, he motioned me over to the same desk, we sat down, and the picture was replicated. I have both hanging in my office. Bush was not a favorite of conservatives, who believed he would be the third term of his predecessor, Ronald Reagan. When he promised a “kinder, gentler nation,” some thought he was being critical of Reagan. In fact, a case could be made that it wasn’t Reagan who was unkind and ungentle, but his critics. Bush faltered when he broke his “read my lips, no new taxes” pledge in exchange for a promise by congressional Democrats to cut spending. The Democrats got their tax increase, but didn’t deliver on spending cuts. He also took heat for nominating David Souter to the Supreme Court. Souter was sold to him as a conservative by Chief of Staff John Sununu, but he turned out to rule with the court’s liberal wing. Still, he gave conservatives Clarence Thomas, a solid constitutional originalist. As president, Bush brought just the right attitude to the collapse of the Soviet Union, warning Americans they should not engage in triumphalism over the collapse of the communist regime (many celebrated anyway) and the end of the Cold War because of the uncertainty of what might follow. He also ordered the military to oust Saddam Hussein’s forces after they had invaded Kuwait, a highly successful operation. Any epitaph on the life of George H.W. Bush must include at least three words: character, honor, and integrity. From his service in World War II, to his political career and post-presidency, not to mention his faithfulness to Barbara, his wife of 73 years.